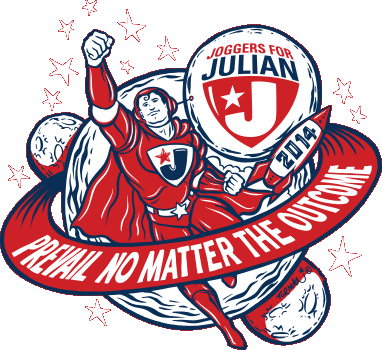 We will walk to honor Julian on September 29, 2018. Join our team or make a donation for Time to Fly. We run to support research in the prevention, diagnosis, treatment, and cure of childhood cancers and blood-related disorders. These advancements will help other kids and their parents overcome the challenges cancer presents to them. Learn about our team, read Julian’s story, and JOIN US! The Time To Fly season has ended for 2016, but we’re already looking ahead to 2017, when we will hit our lifetime fundraising goal of $100,000 to benefit the Children’s Cancer Research Fund. Follow us on Facebook to get all of the details for 2017 as soon as they are announced. Congratulations to our Captain John Golden, who ran the #TC10mile this morning. He was on the Children’s Cancer Research Fund team, representing.. Thank you to everyone who supported our team yesterday. Even thought the event was smaller this year (just a 5K walk), it continued to be a wonderful..